Carlos R. Stroud, Jr., has an AB degree in physics and mathematics from Centre College, and a PhD degree (1969) in physics from Washington University. He is currently professor of optics and professor of physics, and director of the Center for Quantum Information. He is a fellow of both the Optical Society of America and the American Physical Society. He has lectured in more than 75 different universities, held several lectureships, and since 1998 is a distinguished traveling lecturer for the Division of Laser Science of the American Physical Society. "A Jewel in the Crown" - A compilation of essays in chronicling the first seventy five years of the history of the Institute of Optics. For a list of Dr. Stroud's scientific publications, click here. His research interests range over most of theoretical and experimental quantum optics. 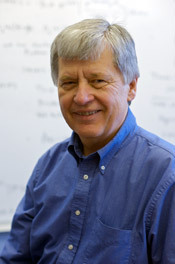 Among the research accomplishments of his group are the first observation of the modification of the spectrum of spontaneous emission by a resonant laser beam, and early observations of various phenomena in three-level atomic systems driven simultaneously by two resonant laser fields including the Autler-Townes effect and coherent population trapping. More recently his group made the first observation of a spatially localized electron wave packet within an atom, and is working on production of quantum states of light and on quantum information.